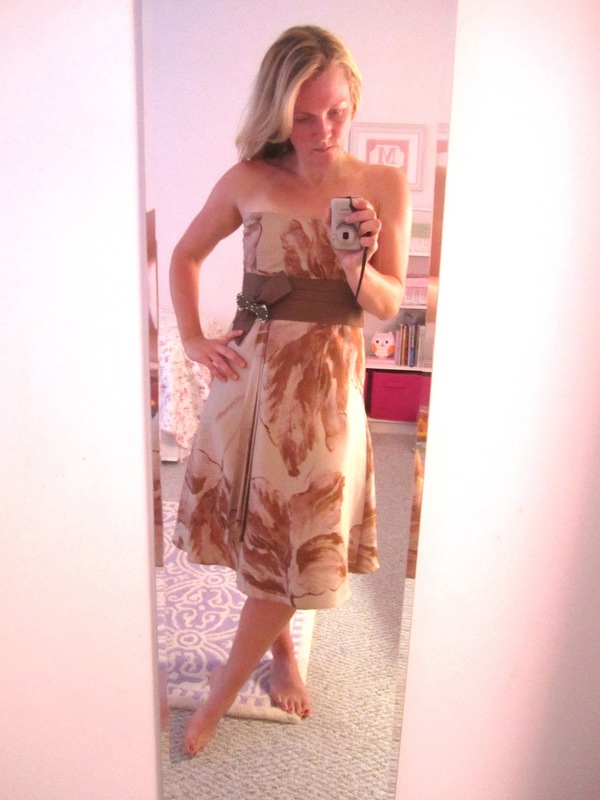 Swoon Style and Home: What Should I Wear? Here's a twist on the What I Wore posts -- I need some help deciding what to wear to a wedding this weekend. It's a good problem to have. I tried on a bunch of fancy dresses from my closet, and these two seem to be the best of the lot. The wedding is in a church and reception in a nice reception hall in the Chicagoland area. So, think formal and fancy but not black tie level fancy. Enough jibber jabber -- here are the outfits. Please excuse my lack of make-up and shoes. I will do my hair nicely for the wedding too. And I will wear jewelry. And I will dance. I bought this dress years ago at Anthropologie. I've worn it to several weddings, but not among the crowd that will be at this one. I love the print and fit. The fabric is silk and it's very comfortable. 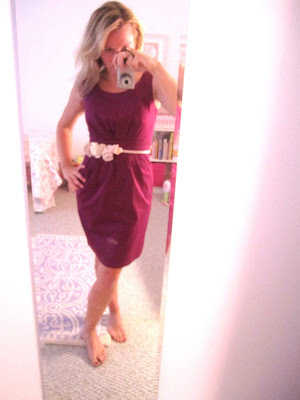 OK, full disclosure: this dress is from the Elmira, New York Target. Jamie and I found it when we attended a wedding a few years ago. 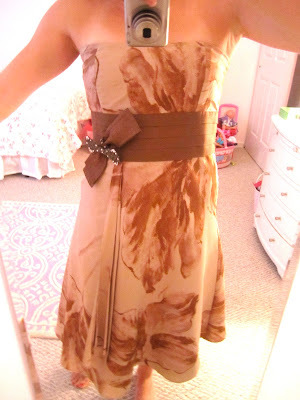 It's got a bit of a sheen to it, so it can be dressed up (or worn to work like in this What I Wore post). 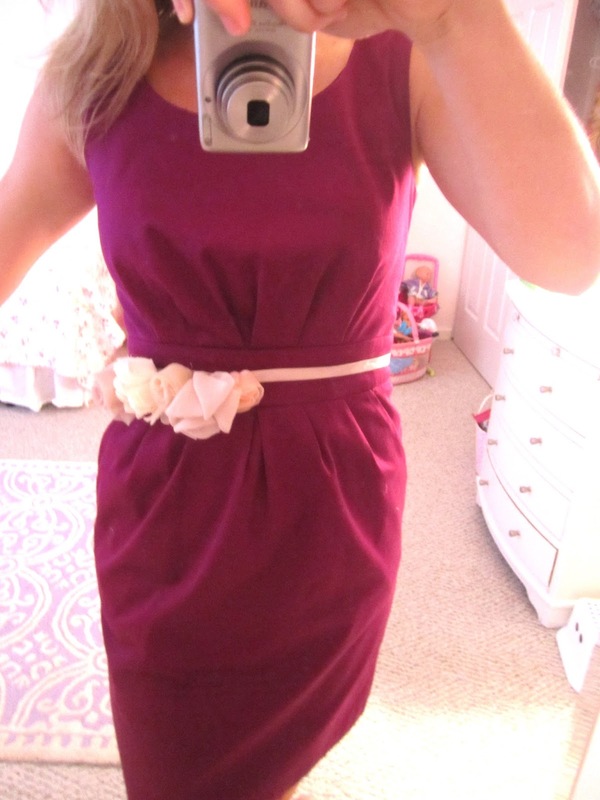 I added an old j.crew fabric flower belt to it. So ... what do you think? Would you go with Option A or Option B? I need to pack tomorrow evening, so please weigh in in the comments soon! Thanks! They are both great, of course. I like the first for daytime and the second for evening. But really, you can't go wrong. Have fun!